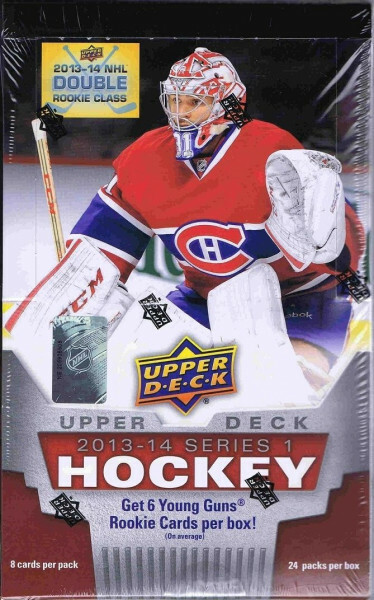 Factory Sealed 2013/14 Upper Deck Series 1 Hockey Hobby Box mit 24 Packs a 8 Cards per Pack. 6 Young Guns Rookie Cards per Box ! Dazu 2 Jersey Cards und weitere Insert Cards ! Produktinformationen "2013/14 Upper Deck Series 1 Hockey Hobby Box NHL"
MVP Rocks UD - with More RC's too! Lord Stanley Returns, with a New Twist! Weiterführende Links zu "2013/14 Upper Deck Series 1 Hockey Hobby Box NHL"
Fanbewertungen für "2013/14 Upper Deck Series 1 Hockey Hobby Box NHL"